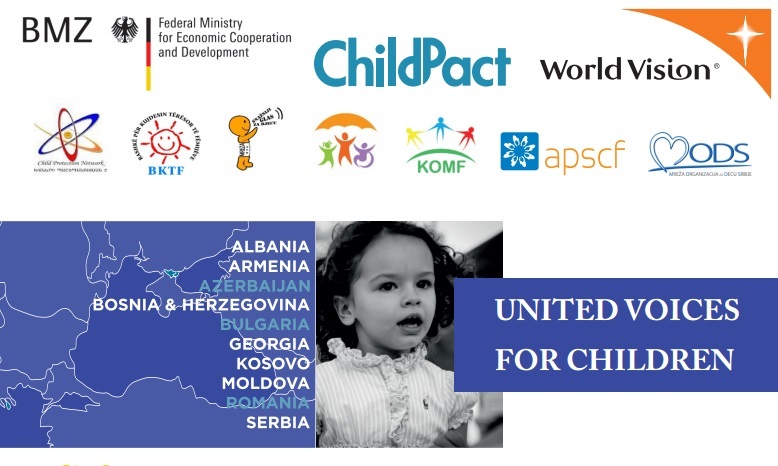 Between March 2015 – December 2018, the Alliance of Active NGOs in the field of Child and Family Social Protection (APSCF), together with 6 NGO networks members of the ChildPact (Albania, Armenia, Bosnia and Herzegovina, Georgia, Kosovo and Serbia) are implementing the project „United Voices for Children”. The project aims to contribute to child well-being, protection and rights through strengthening civil society. Civil society has the expertise and the mission to solve the complexities that inhibit progress and the government has the ability to finance and scale effective interventions. As a part of civil society, regional coalitions of NGOs, strengthened and united under ChildPact, will make use of their expertise and joint power to monitor and influence government action on behalf of vulnerable children. Increase the visibility of national coalitions through trainings, coaching programs, roundtables and field trips for journalists, create and implement strategies for celebrity and business engagements, develop minimum operational standards and building long-term funding habits. Create an evidence base for advocacy and policy engagement by developing a Child Protection Index in each participating country. The Index will capacitate national coalitions to build policy recommendations based on regional snapshots and national comparisons. Advocate effectively at national and regional level by increasing the political and diplomatic engagement with stakeholders and by organizing learning events, mentoring sessions and capacity exchanges. For more details about the project, please see this document. The project “United Voices for Children” is financed by the German Federal Ministry for Economic Cooperation and Development (BMZ), through World Vision Germany and AgroInvest Serbia.